Pre-columbian contact with the Americas is real, because we know that the vikings came via Greenland to Canada in the 11th c. and Amerindians came via Sibera to Alaska c. 14,000 years ago. I think a Japanese boat was found in Alaska in a ruined state from before the Russians' own discovery of Alaska. I don't remember if it went to pre-Columbian times. There are records and stories of what sounds like Amerindians rarely crossing from Greenland to Europe in canoes. One can reasonably propose that since the Pacific islanders got to Hawaii and Easter Island, they got to South America too. The theory that Basque fishermen who we know fished in Greenland also made it to Canada before Columbus' voyage is also reasonable. Thor Heyerdahl and others showed that other transatlantic travel to or from the Americas to the Old World was feasible for thousands of years. But I don't see us having enough reliable finds or claims in records to show whether it's true or not. For example, there are jade masks in Shang China and in Olmec Mexico, both from the 2nd millenium BC, and it's interesting for me to imagine a connection, but I doubt that we have any jade masks made in China found in Olmec Mexico. If such a transatlantic voyage occurred, the hurdles are not only that there were less records made in those days and that Old World wooden and cloth artifacts could rot away, but the difficulty of making a return voyage. That is, it's hard enough to complete an oceanic crossing of about a month's length, and harder still to make it back because of the countercurrents. 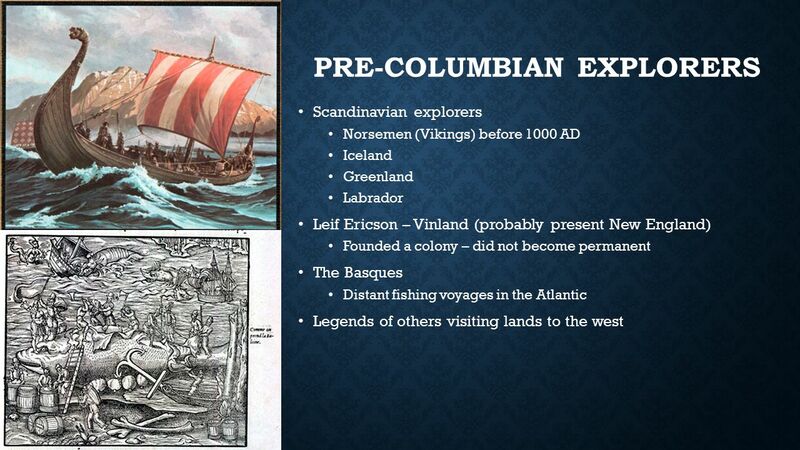 My personal guess is that pre-columbian voyages across the Atlantic did happen besides those of the vikings. One reason is that mankind has in its nature a desire to explore the world. And another is that the voyage is feasible. And it could even happen as an accident. I think that in post-columbian history there are cases of people accidentally being swept from one side of the Atlantic to the other. ^ I don't agree that Vinland is considered New England in particular. I think it either referred to Newfoundland where we found their colony's remains or else to North America south of Labrador. In any case, to return to the thread's main topic, I think that the megalithic remains in New England were only built by Amerindians and postcolumbian colonists, one reason being that we haven't found clear Bronze Age remains or other definite pre-columbian European remains at these sites (like bronze shields). And so what I would most like is for mainstream archaeologists to go over the main New England megalithic sites like Gungywamp, the Upton Chamber & Pratt's Hill, the Goshen Chamber Mystery Hill in depth, to see how much of them were made by Amerindians and how much by the New England colonists. Since you asked if there is research involving mainstream scholars, I can provide you with some info in that regard. I'm a member of the RI chapter of the New England Antiquities Research Association(NEARA), and was research coordinator for the RI chapter in the late 70's through the 1980's. I would say the most prominent mainstream archaeologist in New England who is a proponent of Native American origins for many of the stone structures and features that dot the landscape in the Northeast is Curtiss Hoffman of the anthropology dept of Bridgewater State University. From this page, click on "faculty " for a short bio of Dr. Hoffman. Dr. Hoffman has been working on a survey of lithic features of the east coast of the United States. In particular cairn sites. Indeed, it is where cairn sites are concerned that mainstream archaeology has principally joined the debate as to whether such sites are Native American in origin or if they are mostly colonial and post colonial settler features. In particular, and as a member of NEARA, Dr. Hoffman has been working with Mary Gage, and her son James Gage, with the help of RI Neara member Steve DiMarzo in recording and documenting cairn sites in RI. For a summary of their work in RI, see "Exploring and Reporting Stone Structure Sites in Rhode Island", Mary Gage, James Gage, Steve Dimarzo, NEARA Journal, Vol. 46, No. 2, Winter, 2012. Ives, T.H. "Remembering Stone Piles in New England", Northeast Anthropology 79-80: 37-80, 2013. Gage, Mary and James, "Testing the Stockpiling and Field Stone Clearing Pile Theories", Bulletin of the Massachusetts Archaeological Society(editor Curtiss Hoffman), Vol. 76(1), Spring 2015. I have many photos of lithic features from RI in particular, including beehive and platform cairns, rocking stones, chambers, perched rocks, etc, but they are likely too large to upload here. I do believe many of the perched boulders can be readily explained as the result of post glacial erosional activity. However, that does not exclude their possible incorporation into Native American sacred landscapes. It is of interest that local Native American researchers, including Historic Preservation Officer Doug Harris of the Narragansett tribe is very much a proponent of the Native American origin of many stone features, including cairnfields in the Northeast. I do not doubt that there were numerous cases of pre-Columbian “contact” with the Americas. On both coasts of both continents. There are just too many “out of place artifacts” to explain away otherwise. But the real question is, what was the effect of these contacts? His was not a voyage just for academic interest. He was expected to bring back something of value to pay back the expense of his trip. Not the expected results, but knowledge of something that changed world history. A fishing camp, a place to butcher whales, even a refuge from major troubles back home, does not have the impact that gold measured in tons has. Due to concerns about plundering, I will have to withhold commenting on native cairns. Besides which, I am busy with 'Ancient Alien Cats - The Series". kbs2244 wrote: I do not doubt that there were numerous cases of pre-Columbian “contact” with the Americas. I am very very very skeptical of out of place pre-Columbian artifacts in the Americas coming from Europe or West Asia or Africa besides those left by vikings. Please let me know which ones you consider most reliably authentic that are not left by vikings. The Treaty of Tordesillas between Spain and Portugal was in the late fourteenth century. This line of demarcation was about halfway between the Cape Verde islands (already Portuguese) and the islands entered by Christopher Columbus on his first voyage. What was not realized at the time was how far east S A came. That is why Brazil, covering most of eastern S A, belonged to Portugal.